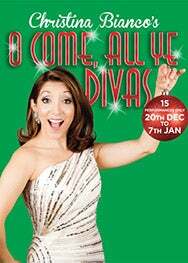 We do not curently have theatre tickets available for Christina Bianco's O Come, All Ye Divas! This could be because we have simply sold out or it could be that this show is no longer running. The information on this page remains purely for historical and informational purposes. Join Celine Dion, Adele, Barbra Streisand, Shirley Bassey, Britney Spears & more of your favorite female vocalists, on stage together in the singular form of Christina Bianco! A girl of a thousand voices, Bianco’s diverse repertoire spans from Edith Piaf to Ariana Grande. Through soaring vocals and jaw-dropping impressions, the show will feature classic renditions and unlikely interpretations of beloved holiday tunes. With hilarious sketches, interactive games, and a fabulous band, Christina will take you on a seasonal celebration like no other! Broadway and West End performer Christina Bianco’s singular voice and comedic charm has brought audiences around the world to their feet. Bianco captured international acclaim as a YouTube sensation with her ‘diva’ impression videos, gaining over 23 million views. She has performed on The Ellen Degeneres Show, The Paul O’Grady Show, This Morning and Graham Norton on BBC Radio 2. Two-time Drama Desk Award nominee, Bianco made her West End debut in Forbidden Broadway at The Vaudeville Theatre. She has performed her critically acclaimed solo shows, Diva Moments and Party Of One, to sold out crowds in the US and the UK. She recently completed a 14 city UK tour, titled, Me Myself And Everyone Else, earning 5 star reviews across the country.